Learn to incorporate the science of compassion, the healing arts of lovingkindness meditation (also known as metta), and the liberating wisdom of the Buddhist tradition into your mindfulness teaching and practice. Develop the qualities needed to successfully offer compassion meditation; self-compassion, loving presence, and wise listening. 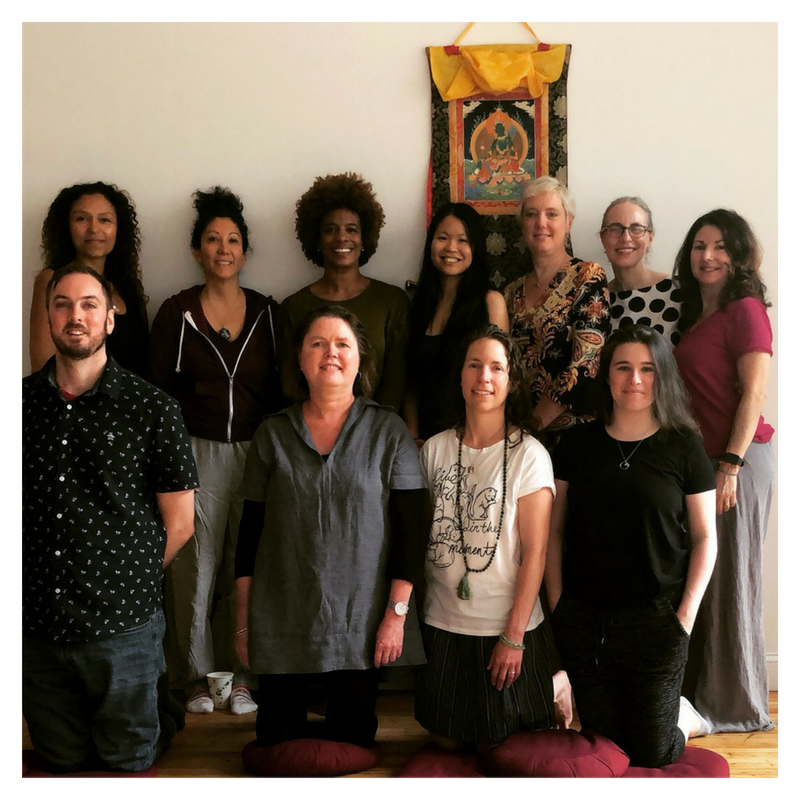 With our experienced teacher-practicioners; Kimberly Brown, metta and compassion teacher, and Renee Bochman, Cultivating Compassion Training instructor. Cultivate your own voice in practice sessions that ready you to integrate wisdom, compassion, kindness, caring, and balance into an approachable and skillful teaching style. Research indicates that the cultivation of compassion has many beneficial effects, including: improvements in personal relationships; decrease in inflammation; improvement in cardiac function; a boost in pro-social activities like helping others; enhanced ability to feel compassion for oneself and others; increased calmness and ability to handle stressful situations; better engagement and communication in relationships; and increased job satisfaction and decreased job overwhelm. IDP is offering this training to mindfulness and meditation teachers who wish to deepen their knowledge and understanding of lovingkindness and compassion practices, as well as to caregivers, therapists, educators, life coaches, social workers, yoga teachers, and experienced meditation students who wish to effectively offer these practices to their clients, students, patients, and others. IDP LKMTT recognizes the transformative power of compassion developed through secular Buddhist practices integrated with science and psychology. Exploring the source texts, history, and current scientific research on lovingkindness meditation, self-compassion, compassion, gratitude practices, and other related modalities. Teaching step-by-step guided meditation instruction. Two intensive online interactive video workshops exploring topics relevant to compassion and lovingkindness development, including dealing with difficult emotions, RAIN technique, and coping with burnout and developing resilience. One final intensive weekend workshop for participant presentation of personal project: a curriculum and practice designed to the specific needs of their audience/group/clientele, with teacher and peer feedback and encouragement. This program is led by an exceptional pair of talented and experienced teachers to give you the mentoring you need to confidently and wisely lead others to develop their minds and hearts. IDP recognizes that our influence as a meditation teacher training center depends on the integrity of our teacher-practitioners and our deep respect for the Buddhist traditions upon which these practices are based. We offer all our trainings to awaken everyone to the deep interdependence shared by all living beings, for the benefit of all. Successful completion of mindfulness or meditation teacher training OR two years of teaching mindfulness OR a career in teaching, social work, psychology, or profession which includes mentoring or healing. Yoga teachers, massage therapists, coaches, caregivers and those who work with mentoring and guiding others are welcome to apply. This program is offered on a sliding fee scale. Please select the highest amount you can comfortably afford to support this and other donation-based initiatives. Scroll below for scholarship opportunities. Space is limited. Please register early to save your seat. All scholarship monies have been awarded for this program. · Upon acceptance, participants must submit a non-refundable deposit of 50% of the program tuition. The remaining 50% of the program tuition must be received by April 13. · Because we can accept only a limited number of applications, we cannot offer refunds. · Payment plans can be arranged for the Basic or Patron Tuition rates only. Contact us if you’re interested in arranging a payment plan. Discover the sources of lovingkindness and compassion training, understand self-compassion, learn foundational techniques to offer LKM, and establish or re-establish your own LKM and gratitude practice. Explore contemporary research and understandings of compassion and its impact for self, family and society, develop your teaching abilities, and deepen your ere exploring gratitude practice, and developing lesson plans for how to work this practice through with your students. in ourselves and in our students. Skillfully being present with suffering, difficult emotions, resisting the urge to give advice, enabling empathy, and developing self-soothing mechanisms. Learning, sharing, and developing tools, practices, and exercises to help students build compassion and expand their capacity to be with difficult emotions and thoughts. Discussion and tools to work with compassion burnout, despair, and hopelessness. Learn about the quality of resilience and how it can be cultivated through the development of balance and wisdom, and recognize our actions have far-reaching though sometimes unseen impacts. Each participant will present guided instruction and meditation developed for the needs of their students/clients/group. Peers and teachers will provide encouragement and feedback. Discussion of other applications for compassion practices, interactive exercises, and time to share experiences and support with each other. IDP is a 501(c)(3) non-profit organization since 2007, entirely supported by the individuals of our community. Monthly Membership enables us to offer free and by-donation community events like our weekly Metta Group, QTPoC meetings, and Livestream programs, as well as providing training scholarships to people of color and those with financial need. Members receive discounts on many programs while affirming their most important values. Become a Monthly Member today.